So there is a recession.Â The economy is the worst it has been since the great depression and we hear about it from every news source on a minute-to-minute basis. The stress level is off the charts and we worry about our jobs or our kidsâ€™ jobs. The Dow Jones plays like a yo-yo, of late hovers around the 8,000 mark and we are all ecstatic about it. Everybody I speak to has made adjustments in their spending habits. We look for cheaper comfort food when we go out; we eat home more often and feel lucky that the little black dress from 3 years ago still fits. Perhaps with a little pink cardigan it will look updated? I know that most of all I have become a discount shopper. I am looking for that great sale, bargain or 25% off coupon. FULL PRICE, not on your life right now. Not even good for the psyche at this point. That is why I was so delighted to receive a discount coupon in the mail from Madame Paulette, one of the best dry cleaners in New York City. I am very careful when sending a garment to them as I call them the JEWELER. The clothes are guaranteed to come back beautifully done and the packaging beyond belief. 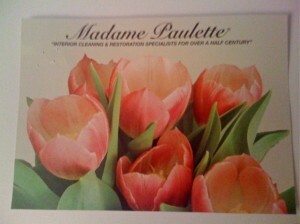 So even Madame Paulette the â€œjewelerâ€ of all cleaners is offering their Spring Ahead promotion of a $100 VIP Discount. Now hold onto your hats. 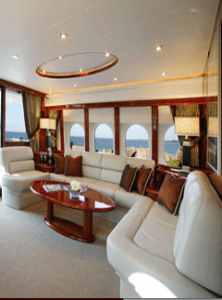 To receive this discount all you need to do is to â€œInvite Madame Paulette â€œ to spring-clean your yacht or private aircraft (homes too). Now thatâ€™s a bargain.